After that long, cold winter, spring is finally here, and it’s now time for our annual spring cleaning rituals! One component of our homes that definitely needs to be cleaned, checked, and repaired after that long winter season is the windows. Our windows are susceptible to damage, as they are always exposed to the elements outside. During winters, the window frames and the panes may have endured a heavy beating, due to the combination of subzero temperatures and the constant falling of snow, sleet, or even hail. Start by wiping away loose dirt with a soft, dry cloth. Dip a clean cloth or sponge in mild, soapy water, a solution of white vinegar and water, or a liquid window cleaner. Wipe the glass surface in a circular motion. Once each pane of a window has been wiped clean, use a squeegee to wipe away the cleaning solution, making sure to always start from the top of each window pane to avoid streaks. Also, wipe the squeegee’s rubber edge with every stroke. Dry window sills with a clean, dry cloth or a lint-free cloth. Make sure to clean windows on cloudy but dry days. After cleaning, you should check your windows for signs of any damage. If you notice cracks, abrasions, or any other issues, you will need the help of experts to get your windows fixed or even replaced. 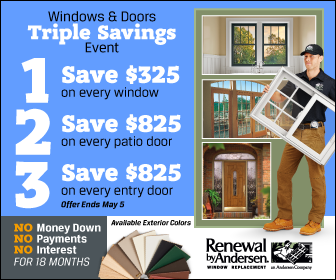 Call Renewal by Andersen of St. Louis and we will assure you that your windows will be as good as new when we’re done fixing it. If they need to be replaced, you can surely trust us with top-of-the-line replacement windows and proper windows installation in St. Charles, MO, and the surrounding areas. Call now to request a free estimate.